The April 2019 Scrapbook Kit included a eye catching, totally dazzling piece of 12x12 teal glitter cardstock from Best Creations. Stunning in colour, in glitter-ness and wow! As gorgeous as it is though sometimes these full sheets of brilliance can be a bit intimidating to work with - I hear yah, they are for me too. First up I created a circle infused layout and used the glitter paper as one of the smaller circles to give each of the clusters a little extra texture and shine. Amidst all the other patterns, watercolor stickers, Nuvo Crystal Drops (Calming Aqua), string and more the glitter is a nice fit and doesn't overwhelm. I adore this photo of me, my little brother and my nephew from my wedding day! Next up I used the glitter to mat a photo. 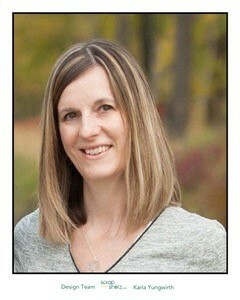 Just a thin mat to draw the eye to the photo not overwhelm it. I love how it looked against this black and white photo of my husband and I at our wedding - you may have guessed glasses were being tinked during this moment! I used a free Cocoa Vanilla Studio Cut File to create those flowers behind the photo. They are designed to match the Happiness collection which was a big part of the Scrap Shotz kit this month. I had so much over on the left of this layout that I decided to do a little peek a boo tear on the right side for balance and popped some glitter up behind that to give it a little shine too. I love this trick for bringing balance to a layout or to just add something to catch the eye in a 'white' space. Just make a little tear, fold it back, adhere it in some way (I tend to use staples) and pop another pattern in the hole you created. 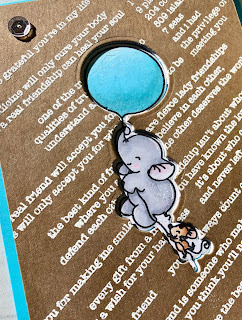 Sometimes its fun to use this little tear as an anchor for an embellishment cluster as you will see I have done in one of the layouts below. For my next two layouts I was all about layering - and used the glitter paper as one of them. Just a little pop here and there to give the design a little something more than a pattern or cardstock paper can do. This first one it is just a small layer where there is a bit of gap behind the ripped pattern paper on the left and then balanced that with a couple of punched hearts on the right. Adding this teal colour to the layout also give me "design permission" to use some of the blue hearts from the stickers in the kit and add some dimension with the teal Nuvo dots in the kit too! Last but not least, I went layer crazy! I just love this photo of our wee puppy sleep smiling - maybe because its the only peace and quiet our house gets these days with a new puppy or maybe because I think her little puppy teeth look like wee planted hearts. Or both! No matter the reason this photo needed a couple of glitter layers because why wouldn't you!? Are you part of our kit club? We would love to see how you used the glitter paper this month. If you have had a chance to play, pop it up on our Scrap Shotz Facebook Group or tag us on Instagram. There are so many great ways to use this paper - we would love to see yours! Want more information about this month's kit? 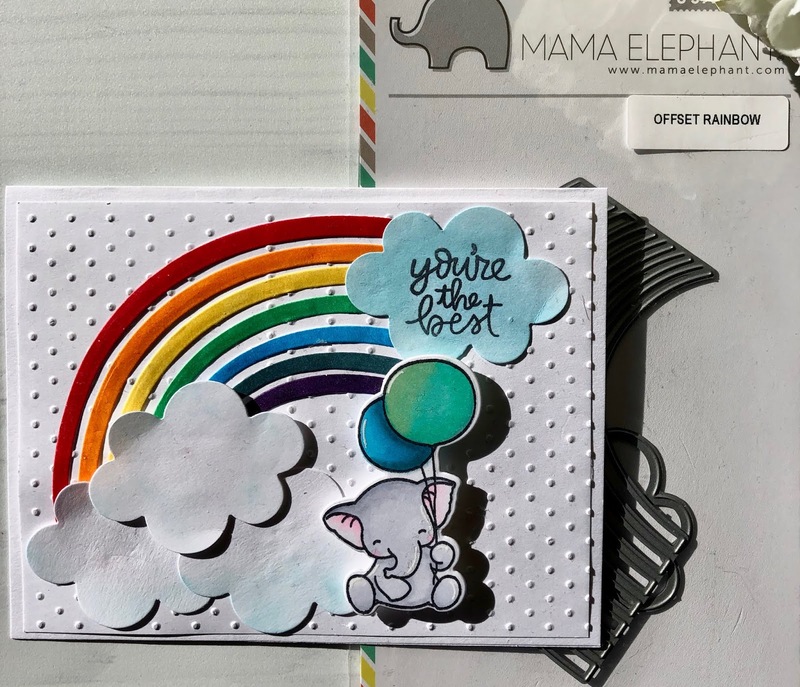 Please swing over to the Scrap Shotz online store to see all the beauty in the April 2019 Kit don't forget the amazing Add-Ons too! Interested in more glitter cardstock? There are many colours available from Best Creations in the Scrap Shotz store. Thanks for swinging by and happy glitter paper crafting! Hello, hello! So excited to share this video flip through with you on so many levels! I have just completed a complete Traveler’s Notebook (we are talking 4 notebook inserts here) of my hike of the 186 mile Pembrokeshire Coastal Path in Wales in 2008. My excitement? It feels so good to finally put the pictures, ephemera, and the words I journalled everyday while walking into a memory keeping solution. Makes me want to go back and walk it again! 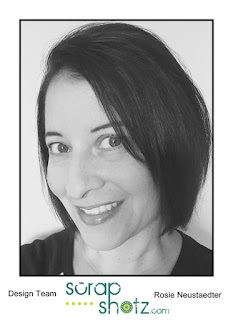 Seems time has washed away the loneliness that can come when walking alone, my Achilles injury, the blisters, the 102 fever from a spider bite infection, and walking in sideways pouring rain 16 of the 19 days. So glad I wrote all those feelings down at the time and had that to transcribe into this TN! More excitement? 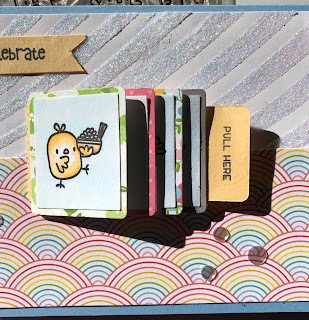 I did it all with the Scrap Shotz, March 2019 Scrapbooking Kit. No joke. The ONLY things I added to this kit were adhesives, the TN Cover and TN notebook inserts, some string, journal pen and a date stamp. I am so in love with the freedom of working from a kit! 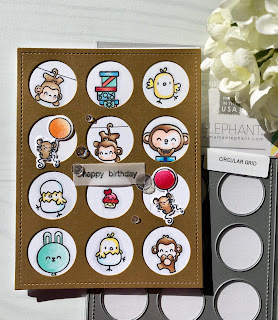 Now I know its April and there is definitely some playing with my Scrap Shotz April 2019 kit going on in my B Hive (scrapbook room) but I was on such a roll with this decade overdue project that I just kept on, keeping on. So glad I did - even if I am sharing March in April. I feel so excited to be done this project and feel like the March Scrapbook Kit was the prompt. One of my favourite things about being part of Scrap Shotz Kit Club is that you never know what will show up next month. 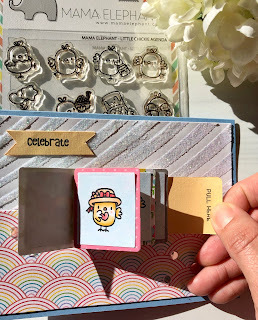 It is not only a delightful surprise but also a prompt to maybe scrap that photo or project or event that hadn't quite got to the top of the scrapbook list. Like a trip from 2008! Thanks for swinging by and happy crafting! Hello friends! Karla back today with another project using the April Scrap Shotz Kit featuring the Happiness Collection from Cocoa Vanilla Studio. This collection is so gorgeous, and together with all the amazing goodies in the Kit you'll be creating lots of scrapbook pages. 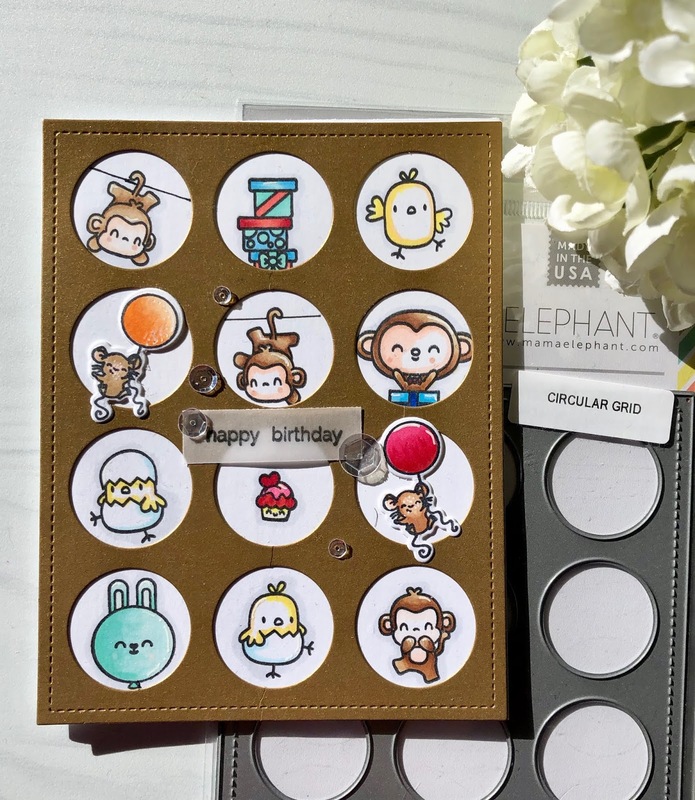 The supplies would be fabulous for some quick and beautiful cards as well! Today, I'm sharing a process video, below, of this fun layout from a Calgary, Alberta crop I went to. I think it's so important to not just document the things my family does, but also those things that are important to me. I'm using lots of goodies included in the kit as well as some fun Add-Ons you can find in the shop HERE. When you're a kit subscriber you'll be guaranteed the kit as well as getting first pick of the wonderful coordinating extras you just might want to add! This was definitely a very fun day, and I'm so happy I got to document it! Thanks so much for stopping by! Be sure to check out the previous two layouts I created with this kit HERE as well as the Kit Reveal HERE. And don't forget you can always check out all the new and fabulous goodies in the Scrap Shotz Store here. Have a wonderful Easter Weekend friends! 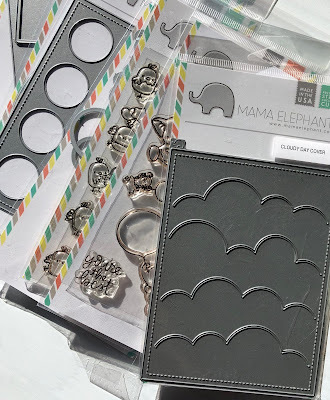 As promised, I am back with more Mama Elephant projects. 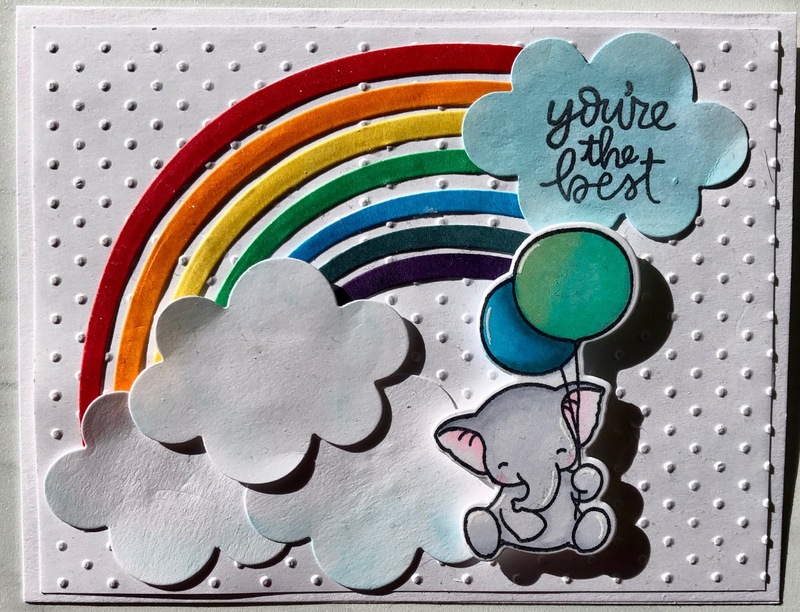 I cut the rainbows and clouds from white card stock. The rainbows are coloured with Copic Markers in rainbow order-ROYGBIV, that's red, orange, yellow, green, blue, indigo and violet. 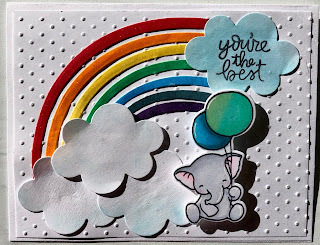 The clouds are inked with Tumbled Glass Distress Oxide ink and the sentiment from the Flying With Friends stamp set is stamped on the cloud in black ink. 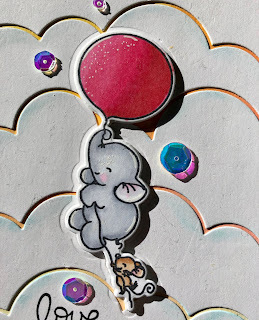 I popped up an image also from the Flying With Friends stamp that has been coloured again with Copic Markers and die cut with the matching Creative Cuts. Here's a close up look at the rainbow, I also added a glitter layer with a Wink of Stella clear glitter marker. 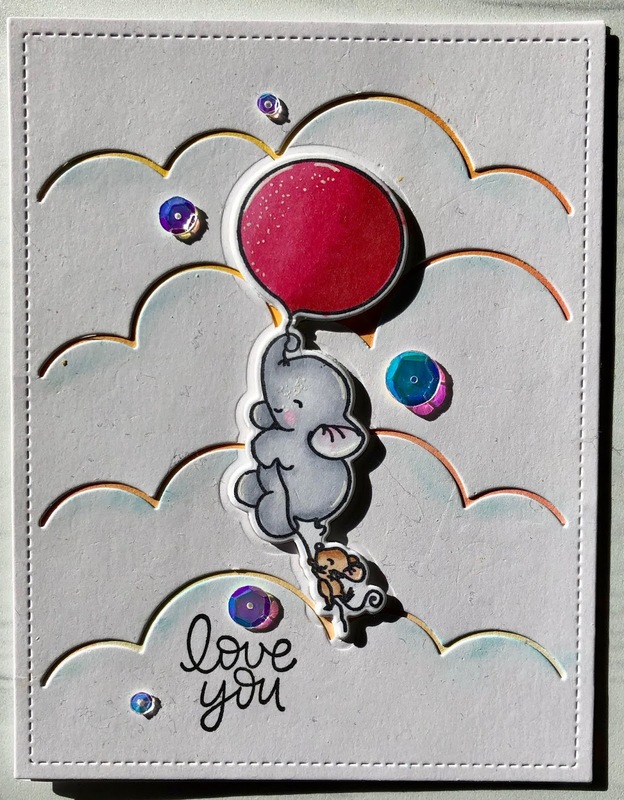 I arranged all the die cuts and glued on a white card stock panel which has been embossed with the Cuttlebug Swiss Dots embossing folder. This second card uses the Mama Elephant Circular Grid Creative Cuts. I die cut 2 frames, one from plain card stock and the second from this coloured card stock in my stash. 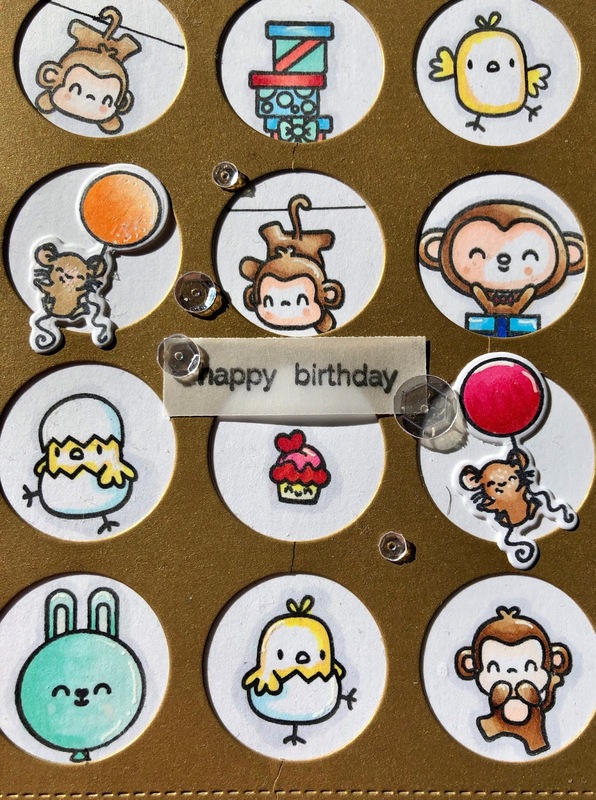 I placed the plain die cut over a piece of copic friendly card stock and traced the circles with a pencil so I should know where to stamp the images. 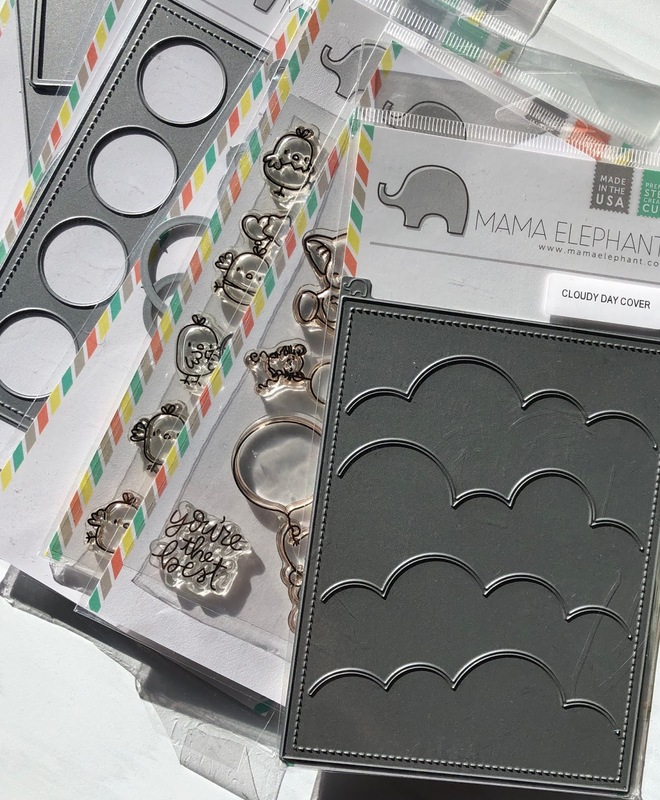 I then stamped images from a variety of Mama Elephant stamps, Little Chickie Agenda, Little Monkey Agenda and Birthday Monkeys. I coloured them with copic markers and drew in a "high wire" for the 2 monkeys to hang from their tails. 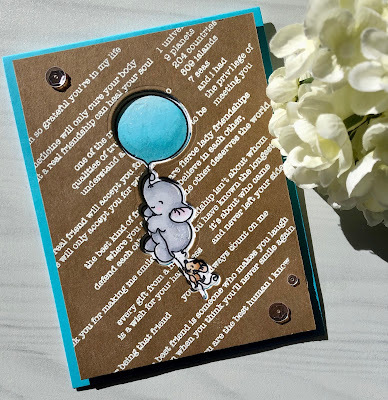 The mouse with an orange ballon and red ballon were stamped and die cut with the Flying With Friends stamp and creative cuts. Next I adhered the die cut panel with liquid adhesive, stamped and heat embossed the sentiment with Versafine Onyx black ink and clear embossing powder. I finished off the card with a few Studio Katia sequins. 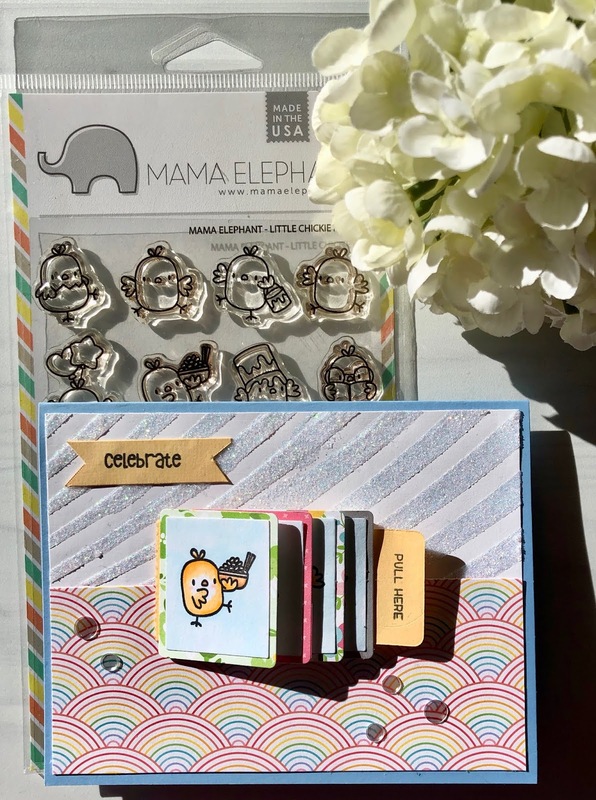 My final card uses the Mama Elephant Flip Slider Creative Cuts and the Mama Elephant Little Chickie Agenda stamp set. The solid die is the slider portion and the small and large rectangles are what flip when you pull the tab. I cut the slider portion from yellow card stock, the large rectangles (4) from the Lawn Fawn 6x6 Spring Fling paper pad and the smaller rectangles (4) from copic friendly card stock. This stamp is not in the store, there is 1 available that's been used for this blog post so contact Sandy directly to order a set in for you or inquire about purchasing the set used for the blog post. Various images were then stamped on the white card stock with copic friendly ink, I've used Gina K Amalgam black ink which is copic, watercolour and coloured pencil w/gamsol friendly! After colouring the images with Copic Markers I layered them over the patterned paper rectangles and then assembled the flip slider. I hope to get a video done soon of how to put the slider together, I watched a few YouTube videos to understand it and it's quite easy once you get it done the first time. After assembling the flip slider I set it aside and worked on the card front. I applied Nuvo Glimmer Paste in Moonstone through the Altenew 6x6 Molded Lines stencil and set aside to dry. The "Pull Here" is from an older Lawn Fawn stamp set called "Push Here". I stamped it and 'celebrate' in black ink on a hand cut banner and adhered with liquid adhesive after the paste dried. I cut a portion from the Lawn Fawn 12x12 Unicorn Mane paper in the Really Rainbow Scallops paper pack and placed it on the lower portion of the glimmered white card front. I then adhered the flip slider with foam adhesive to make it easier to grasp the pull tab and embellished with Pretty Pink Posh clear confetti. Mama Elephant Flip Slider Jennifer McGuire, scroll to 10:30 of the video for excellent instructions to put this together. I hope you've enjoyed these projects and make sure you come back tomorrow to check out more Scrap Shotz monthly kit projects! 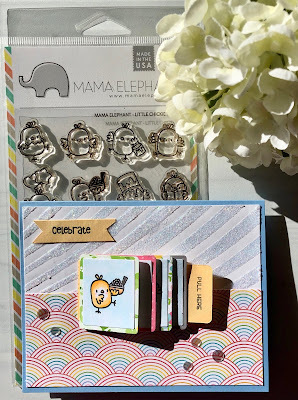 I have combined the Mama Elephant Flying with Friends stamp and creative cuts with the Mama Elephant Friendship Sentiments stamp set. 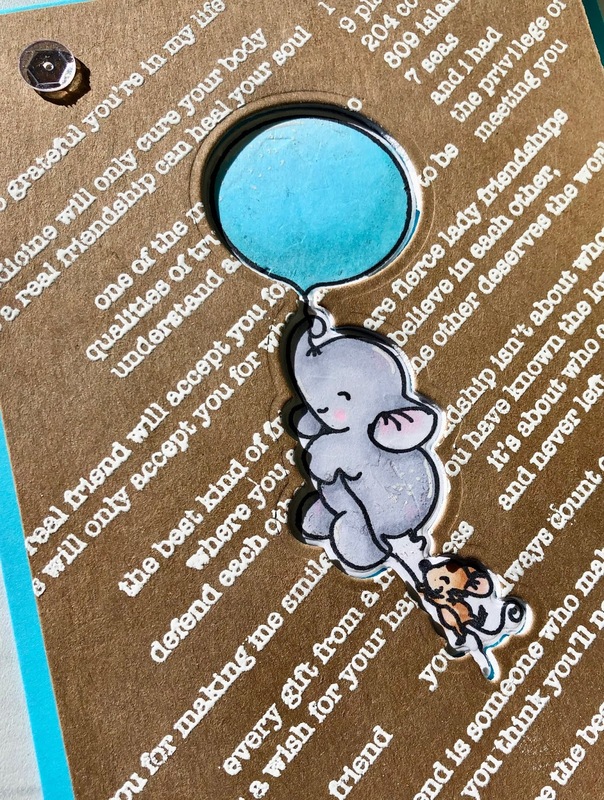 Using the Misti stamping tool I laid out the Friendship sentiments stamps over a Kraft card stock card front, stamped in Versmark ink and then heat embossed with white embossing powder. 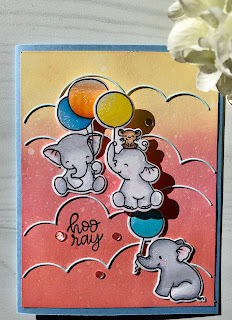 I stamped and copic coloured the image and die cut with the matching ME creative cut. 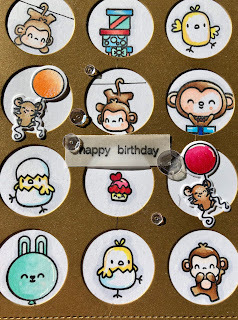 I also die cut the same creative cut from the stamped card front, then inlay the coloured image within, popping up the stamped card front with foam adhesive. This next card combines the Flying with Friends stamp set along with the Mama Elephant Cloudy Day Cover Creative Cuts. I copic colored the stamped image and die cut it with the matching ME creative cut along with cutting a second layer from fun foam to glue behind the image. After cutting the panel from the ME Cloudy Day Cover I lightly inked the clouds with Distress Oxide Tumbled Glass ink. The entire panel is then layered over a Distress Oxide inked card front in Abandoned Coral, Picked Raspberry and Mustard Seed. 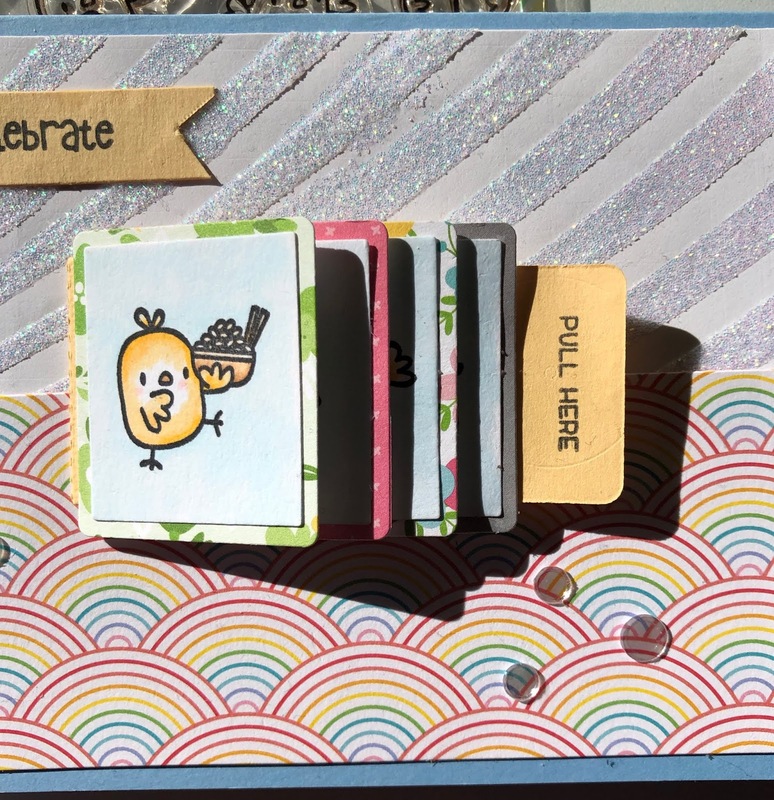 The final card I am sharing today uses the little bitty inner white card stock pieces from the above die cut card front. I inked a white card stock panel with the same colours listed above and spritzed with water to create the oxidized effect. The white cloud "die cuts" were lightly inked with Tumbled Glass distress oxide ink and applied to inked card front with liquid adhesive. 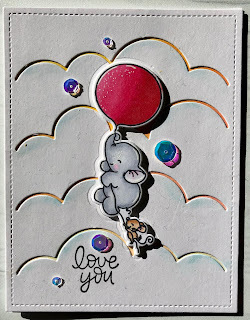 Stamped images are coloured with copic markers and then adhered with foam and liquid adhesive. I hope you've enjoyed these projects as much as I enjoyed creating them! Hello friends! 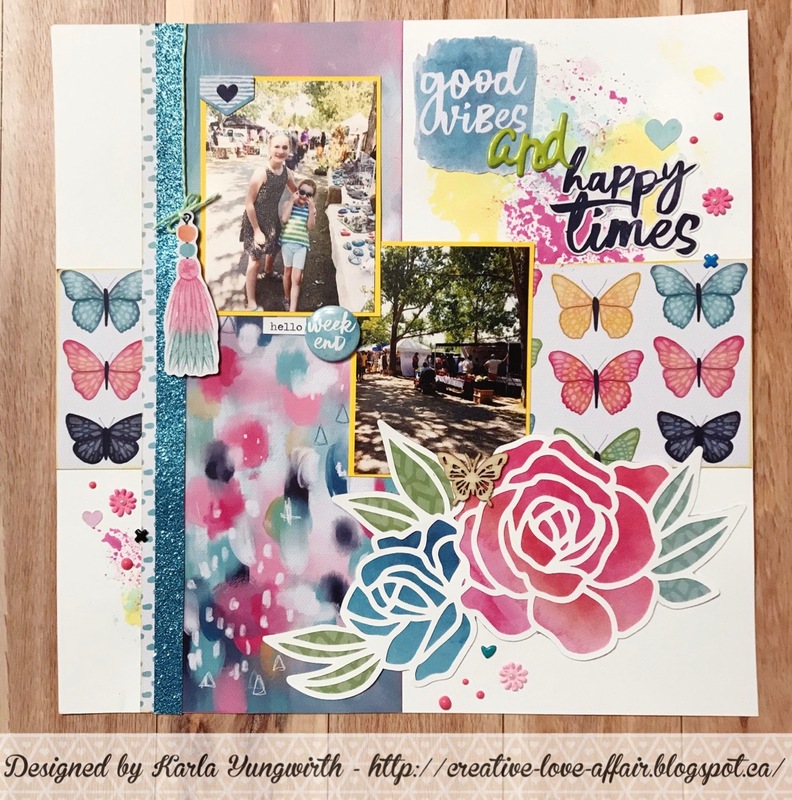 Karla back today with two layouts completed using the April Scrap Shotz Kit featuring the Happiness Collection from Cocoa Vanilla Studio. I love this kit!! The beautiful watercolour and florals are perfect for so many occasions, and since I am definitely in need of some bright spring colours (especially after snow in Calgary last night!!) this is just the thing to make me happy! I started off by using the Creative Scrapbooker Magazine April Sketchy challenge as inspiration along with photos of our family at the Cochrane Farmers Market in Alberta. I used the small flower paper as a border and layered a piece of white cardstock on top before stitching around with my sewing machine. My daughter had been practicing sewing and had green thread in the machine and I decided to go for it, lol. I used some free cutfiles from the Cocoa Vanilla website and cut out the 'lovely' title on white cardstock along with two circle wreaths included. These were the perfect thing to add to the page to coordinate with the sketch. I misted them with Glimmer Mists to add colour and customize them to coordinate with my page. I also used the packaging technique to add some of the mist to the background of the white cardstock. 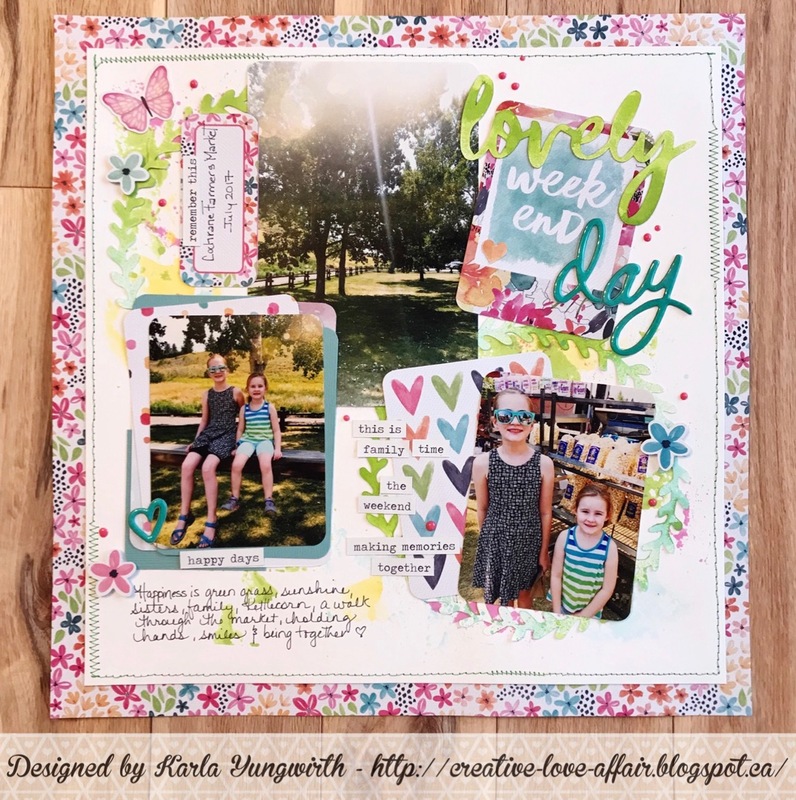 I really love combining fonts to create a title, so I added one of the 3x4 cards with 'weekend' in the center and a 'day' sticker from the Thicker Kaleidoscope Words sticker pack which is an Add-On available. I love the CV Happiness Accessory Sticker Sheet with the tiny word phrases! This is also an Add-On available in the shop. Don't forget as a subscriber you'll get first choice to get those fun Add-Ons you want to coordinate with the amazing kit! I layered some of the words to create some fun sentiments beside the photo of my two girls. I layered my photos on cardstock and paper included in the kit and then embellished with some of those Add-On Thicker stickers and little flowers that come in the Die Cut Ephemera pack, which is part of the Kit. I also added some enamel dots created with the Add-On Carnation Nuvo Crystal Drops. I love being able to customize the size of the dots I'm creating!! For the second layout I'm using a sketch from the SCT 365 Layout Class. I honestly love starting with a sketch! I often find I layer papers in a way that I wouldn't have thought of, and even if I use this sketch again and again it always turns out different each time! I used the 'good vibes' sentiment from one of the 3x4 cut apart pages in the Kit to start creating a title, adding the Add-On Thicker Kaleidoscope Stickers 'and' with 'happy times' from the Diecut Ephemera pack. I again used the packaging technique to pick up mist from my splat mat with a plastic package and then press it onto the white cardstock background. I absolutely love the tassels in the Diecut Ephemera pack in the kit and I used a bit of twine from my stash to create a hanging effect. I added a 'hello' from the Add-On Accessory Sticker Sheet and layered on the 'weekend' flair badge from the Kit. This wonderful flower diecut is from that free cut file (linked above) and I backed it with papers all included in the Kit. I added the pretty wood veneer butterfly and embellished with the tiny pink flowers - also in the Kit. A few more customized Nuvo Crystal Drops (an Add-On) finish off the pretty details. Thanks so much for stopping by today! Be sure to check back all month for lots of projects featuring this gorgeous Kit and Add- Ons, and don't forget to check out the Reveal Video post HERE where you can see exactly what's included in the kit! Have an awesome weekend friends, and happy crafting! Hello friends! It's Karla here today, and I'm so excited to bring you a new Kit Club reveal with the April Scrap Shotz Kit featuring the Happiness Collection from Cocoa Vanilla Studio!! The lovely spring colours and gorgeous watercolour look that Cocoa Vanilla is famous for is so lovely - and of course would make anyone very happy!! 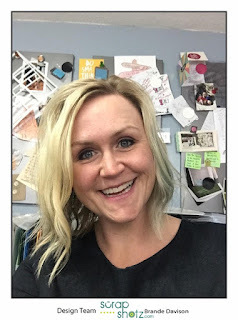 Here's a look at the video where I'm giving you a closeup look at all the wonderful supplies included in the kit - as well as a few yummy add-ons available! ... and back sides! 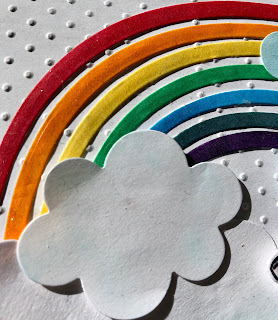 Ummm, you might want to grab the Double Patterned Paper Add-On - these are beautiful designs! CV Diecut Ephemera - this is a huge pack of beautiful diecuts!! CV Flair badges - love these! Thanks so much for stopping by today! Be sure to check back all month for lots of projects featuring this gorgeous Kit - I'll be back Friday with my first project. Have a wonderful week friends!